Sometimes you may want to add DVDs to iTunes library and sync them to iPhone iPad. But DVD is not included in iTunes supported format list. To achieve this goal, you will need to rip the movie contents out of DVD disc and then convert them into MP4 or MOV first. Follow the tutorial and get the best DVD to iTunes converter freeware. iTunes is prized for syncing purchased movies from computer to iPhone iPad iPod but is devalued for inability to add DVD movies like always. This is because the latter is against Apple's financial profits. Frankly, to freely import DVD movies to iTunes will somehow reduce demand for online iTunes store, which needs $4.99 to $14.99 for each rental or purchase. No wonder Apple don't encourage any download of DVD movies to iTunes. But it's absurd to waste money on digital copies when you already own a large collection of DVD movies. The truth is you can get your movies and TV shows digitally and freely without even going to iTunes store - by means of DVD discs to iTunes ripper freeware. 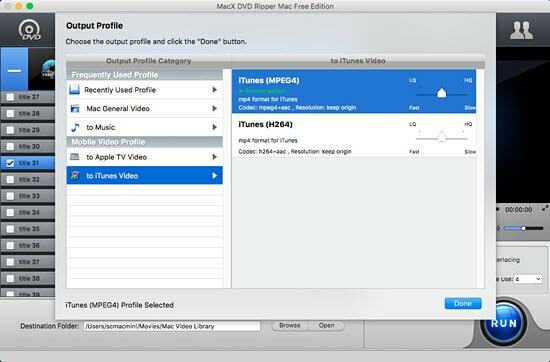 MacX DVD Ripper Free Edition - Fast/FREE rip protected DVD to iTunes MP4 MOV M4V, regardless of CSS, region code, or other DRMs. Freely put DVD movies to iTunes library & watch them on iPhone iPad. 1. Cannot rip protected DVD to iTunes: Commercial DVDs are encoded with various DRMs for anti-piracy use. This makes common rippers like Handbrake crash, stuck, freeze or rip DVD halfway during conversion. Some tools will even get errors such as "I/O error", "no title found error", etc. So a DVD movie to iTunes ripper that can rip protected DVD is highly demanded. 2. DVD ripping is painfully slow: A feature-length DVD ripping process is normally finished within 30 seconds. But there are still many rippers conduct the process at a conversion frequency below 40 fps, taking unbearably 90 min to encode a DVD into iTunes format. So a fast DVD ripper is a must-have. 3. Hard to navigate: An easy-to-use DVD ripper will receive thumbs-up and users don't want any additional bells and whistles that don't translate into good-look image or fast ripping process, which on the contrary perplex users due to the clumsy interface, making them stuck when your add DVD file to iTunes. If you have some awesome DVDs and want to free import DVDs to iTunes, so that you can transfer DVD to iPad iPhone for sharing and enjoying, in a way faster and easier without encountering any DVD copy protection problems. Here is an effective way to get DVDs into iTunes (11/12) with no cost: MacX DVD Ripper Free Edition. This free DVD ripper for iTunes can remove various DVD copy protections like Sony ARccOS, region protection, CSS encryption, etc. That is to say, you can free convert/import/transfer DVD onto iTunes 12/11 without limitation of DVD disc. No matter whether you are a beginner or an expert, with its easy-to-use interface, just a few clicks you can successfully import DVD movies to iTunes compatible format such as M4V, MOV, and MP4. The following paragraphs are written down for assisting you to rip DVD discs to iTunes for free step by step. Step 1. Load DVD Movies or DVD Folder. Click "DVD Disc" to add DVD from DVD drive. Or you can click "DVD path" to import DVD from DVD folder. Within less than 3 seconds, the DVD title etc will be automatically scanned and selected. Step 2. Choose Output Video Format. After DVD imported, go to Output Profile -> choose "to iTunes Video". Here you're suggested to select "iTunes (H264)", for H.264 keeps a better balance between DVD movie quality and DVD file size than MPEG-4. See H.264 VS MPEG4. You can also directly and free rip DVD to MP4, MOV, M4V and convert DVD to Apple TV format for large-screen playback. Step 3. Choose Output Folder. Click "Browse" button to specify the destination path for the ripped DVD. Step 4. Start to Rip DVD Movies to iTunes. When all settings are done, click "RUN" button and this free DVD ripper Mac software's DVD ripping engine will go into action. Generally, a 2-hour DVD movie will be converted to iTunes within 30 minutes. Note: The free DVD ripper for iTunes is uneligible for 99-title DVDs ripping or other sophisticated disc conversion. But you can upgrade to its pro version - MacX DVD Ripper Pro, which now conquers all types of DVDs, incl. Disney Fake DVDs Zootopia, new or DVD with 99 titles such as I Am Wrath, Moonlight, and even the non-UDF formated AV DVDs, workout DVDs unplayabled on VLC. !!! The DVD ripper developer only encourages you to use this free DVD to iTunes ripper to rip DVDs to iTunes for legal personal use, instead of illegal reproduction or distribution of copyrighted content. Please obey your local DVD copyright law before doing it. DO NOT do harm to others' lawful rights and interests. 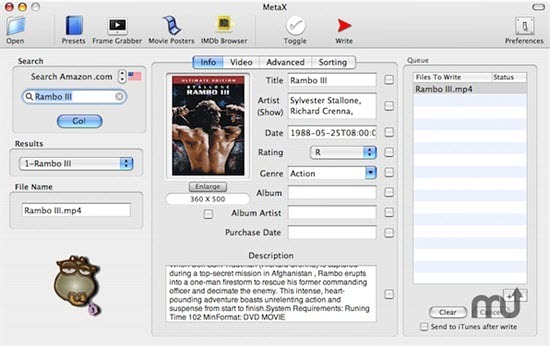 Once you have the ripped movie saved on your computer hard drive, you can give the movie some information (cast, art, chapter information, etc) with the aid of tools like MetaX, if you want the movie to look like that you download from iTunes store. 1. Open the movie by click + button. 2. Once you import them, it will show the results in a list at the left side. Just select the files you wish to modify or manually input the tags into the fields. 3. Write the tags and add to iTunes. If you don't like to add any tags to the ripped movie, you can directly import DVD movie to iTunes: Go to start iTunes -> Choose File -> Add to Library -> Select the movie file or drag the movie into it. It will automatically add the ripped DVD movie to your iTunes library. After you rip and import DVD to iTunes, you can sync this DVD movie from iTunes to iPhone or iPad for watching on the go. Just connect your iPad or iPhone to computer and launch iTunes to detect your iOS iPad or iPhone. Afterwards, find DVD movies from "Movies" category on iTunes and choose to "Add to Device" → "iPad/iPhone" via a single right click. Then you can play DVD on iPhone iPad anywhere. The whole process is quite simple, but the problem is that the speed of large-sized DVD movie to iPad iPhone via iTunes is significantly slow (DVD movie is usually 4.7GB around), along with half crash sometimes, let along the constant data loss during syncing. No wonder iTunes becomes an object of public denunciation. If you can't bear the snail speed and data erasing iTunes brings to you, you can consider the iTunes alternative named MacX MediaTrans, which enables you to transfer DVD to iPad, iPhone/7 without iTunes. It lets you only wait 3 mins or less to accomplish the DVD to iPad iPhone sync task as long as your computer has the top level hardware configuration. 1. Download DVD to iPad sync software. Free download this DVD movie transfer tool on Mac or Windows. Run it and connect iPad or iPhone 7/Plus via a USB cable. 2. Import DVD Movie to iOS Transfer. Click "Video" on the main interface and then hit "Add Video" to import DVD movie from Mac to this iTunes alternative. 3. Sync DVD to iPad iPhone. 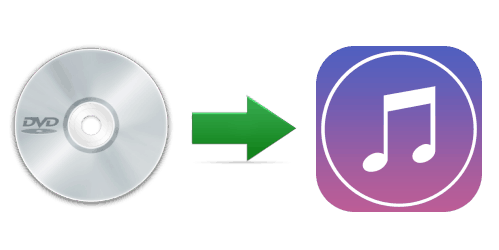 Press "Sync" button to transfer DVD movies to iPad iPhone from MacBook Air/Pro/iMac etc. within 5 mins only. Note: During the DVD to iPad iPhone transfer procedure, please Do Not pull out your iDevice; keep it connected. And this DVD movie sync app also supports you to batch transfer movies, videos, music, iBooks, VoiceMemo, Ringtones between Mac computer and iOS iPhone iPad iPod without the unfriendly iTunes. What is iTunes (Wikipedia): iTunes is a media player, library, online radio broadcaster and iPhone iPad manager developed by Apple. You can play, download and organize digital downloads of music, video, movie, audiobooks, podcasts, etc from iTunes on your computer running on both Mac and Windows. It is also available on iOS devices (iPhone, iPad and iPod).